Now thinner, lighter, and faster - Nexus 7 brings you the perfect mix of power and portability and features the world's sharpest 7" tablet screen. The clean, simple design features a slim body, a thin bezel and a soft-touch, matte back. So it sits comfortably in the palm of your hand while the bright, beautiful 7" display brings your entertainment to life. At just 0.64lbs (290g), the all-new Nexus 7 is light enough to take anywhere and fits easily in bags, backpacks, and even back-pockets. With up to 9 hours of HD video playback and 10 hours of web browsing or e-reading, there's plenty of juice to get you through the day, and built-in wireless charging means you can charge, grab, and go. With dual-band Wi-Fi and optional 4G LTE, including support for hundreds of networks worldwide, you'll stay entertained - and connected - wherever you are (select models only). 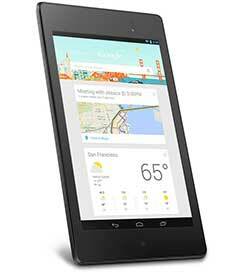 The world's highest-resolution 7" tablet puts over 2.3 million pixels in the palm of your hand. With 323 pixels packed into every inch, you can read text that's sharper than the printed page, see images more vivid than the highest quality photo magazine, and watch videos come to life in vibrant 1080p HD. 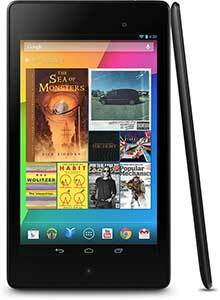 Nexus 7 is made by ASUS and packs a serious punch. 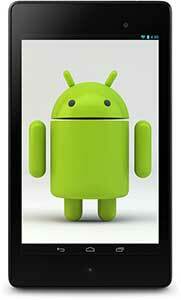 With a quad-core Qualcomm Snapdragon™ S4 Pro processor and 2GB of RAM, everything runs faster. Plus, high-performance rendering ensures 3D graphics are smooth and dynamic. Nexus 7 features stereo speakers and Surround Sound powered by Fraunhofer3 (the MP3 inventors) so you get rich and immersive audio. Hear it all more clearly with finely tuned volume boost technology that makes dialog and sound crisp and easier on the ears. Nexus 7 comes loaded with your favorite Google apps - like Chrome, Gmail, YouTube, Hangouts and Google Now - so you can browse, watch, share and stay connected wherever you go. And because Google apps are designed for the cloud, everything is simple and works seamlessly across your phone, tablet and computer. Now you have all the stuff you need, when you need it. 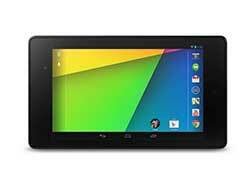 Nexus 7 is the first tablet to ship with Android 4.3, the latest version of the world's most popular mobile operating system so it's fast, fun and easy to make your own. Share your tablet with friends and family - each person has a separate customizable space, including personal homescreen, wallpaper, apps, storage, and more. You can also manage access to apps and content to create an experience that's appropriate for each member of the family. Nexus 7 is great for gaming and with favorites like Prince of Persia, Asphalt 8, and Riptide GP 2, you can tilt, tap, and touch your way to the top. The brand new Play Games app also lets you track your achievements, play with (or against) friends and gamers around the world, and discover new exciting games. And with an ever-expanding number of tablet-optimized apps like Flipboard, Expedia, or The Fancy, you'll find all the apps you love, and love the many new apps you'll find. Kick back with the world's largest collection of eBooks, listen to millions of music tracks with All Access, and immerse yourself in thousands of movies and TV shows on Google Play. Special inserts for connectors allows you to charge without removing the cover, keeping your Nexus 7 FHD protected at all times. 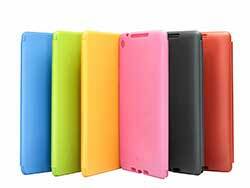 Soft microfiber and durable polyurethane construction. 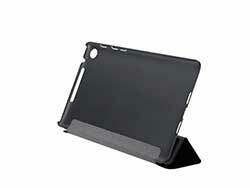 Features a folding-cover that can prop up the tablet like a stand. Two positions - One to watch movies, one to type on the tablet. Cut-outs and inserts tailored for all of Nexus 7 FHD's camera, ports, and buttons. 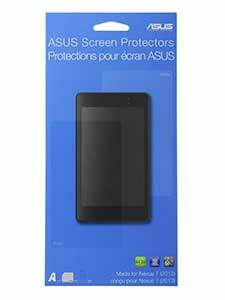 Slim and sturdy design fully protects the Nexus 7 FHD front and back from everyday bumps and scratches. Two screen protectors in one packages: 1x Matte Screen Protector, 1x Glossy Screen Protector. As the world's top three consumer notebook brand and maker of the world's best-selling motherboards, ASUS prides itself by making products that always "START with PEOPLE." With a persistent approach to innovation, ASUS goes beyond satisfying current consumer needs to surpass expectations and spark the imaginations of people everywhere. ASUS designs and manufactures a diverse range of products as part of our relentless search for incredible, including motherboards, graphics cards, displays, desktop and all-in-one PCs, notebooks, netbooks, networking devices, servers, smartphones and tablets. Driven by innovation and committed to quality, ASUS won 4,168 awards in 2012 and recently received the recognition for the 2013 PC Magazine Reader's Choice Award. ©2013 ASUS Computer International. All Rights Reserved. ASUS is a registered trademark of ASUSTeK Computer. All specifications and terms are subject to change without notice. Please check with your supplier for exact offers on selected models. Products may not be available in all markets. Product may not be exactly as shown in photos. Actual colors may differ from their appearance due to variation of monitor restrictions and color processing. All trademarks are registered to their respective companies. ASUS shall not be liable for technical or editorial errors or omissions contained herein.